If you spend a great deal of your time downloading and uploading files from the internet, then you must have come across ZIP and RAR files. ZIP and RAR are the most popular and widely used file formats to archive compressed data. They are undoubtedly the undisputed king of compressed files. While both use the superfast LZ77 compression algorithm to compress and decompress content, surely one has a little edge over the other, may be in terms of speed and efficiency. Both are compression algorithms that efficiently compress your files to reduce their size without affecting the content of the files. While a RAR file is an archival file created with the WinRAR program, which can be downloaded from the internet as a free trail for several days, ZIP file is a common file extension associated with several programs such as WinZIP, WinRAR, and Freebyte Zip. This article explains the difference between ZIP and RAR files. The ZIP file format was actually created by Phil Katz and Gary Conway following a lawsuit against PKWARE filed by System Enhancement Associates (SEA). The lawsuit claimed that the archiving products of PKWARE were taken from the SEA’s proprietary ARC archiving system. However, the lawsuit was dropped followed by a legal settlement with the SEA. Katz released his first compression program to use the new ZIP file format called PKZIP and subsequently released it into the public domain in 1989. Today, ZIP is a widely used format for lossless data compression and is supported by several software utilities including the built-in ZIP support provided by Microsoft Windows and Mac OS X. The best part, ZIP files can be opened with any program that creates ZIP files. Like other archive formats, ZIP files are data containers that contain one or more files together in a compressed or zipped format using Zip compression. Well, ZIP archives are capable of more than just compressing files; they can encrypt files (password protected) and split archives with just a few clicks. Multiple files can be compressed or zipped using several methods such as LZMA, WavPack, PPMd, BZIP2, DEFLATE, etc. Each file can be stored separately, so that they can be accessed randomly and because they are archived individually, it makes it easy to extract them, or add new ones without even zipping in the entire archive. ZIP archives can also contain additional content which are not related to the archive thereby making it a self-extracting archive. RAR stands for Roshal Archive Compressed file, which is a proprietary archive file format named after its Russian-origin creator Eugene Roshal. Like other archives, RAR contains one or more files or folders together. Think of RAR as a folder just like a normal folder containing several programs or files, however, unlike a normal folder on your hard drive, RAR files require third-party software to open and extract the contents of the archive. It’s a native file format of WinRAR archiver which stores multiple files in the compressed form – all you need to do is unpack its contents to access the files. It uses a higher compression ratio than regular ZIP compression and incorporates a proprietary compression algorithm that handles lossless data compression, file spanning, error recovery, and more. The archives files normally have the standard “.RAR” file extension. ZIP is an archive file format created by Phil Katz as a standard format for lossless data compression which incorporates several compression algorithms to compress/decompress one or more files. RAR is a proprietary archive file format developed by a Russian software engineer Eugene Roshal. RAR format can compress a file much better than the same when done with ZIP format, meaning the rate of compression of RAR is better than that of the ZIP format. Also RAR archived smaller sizes as compared to ZIP archives, which makes RAR a better alternative than ZIP. The main advantage of using a ZIP format is its popularity. As ZIP file format was developed a long time ago, it has a little edge over the RAR format and is still the most widely used archive type, which still accounts for a significant number of archive files on the internet. A third-party software program called WinRAR is required to open and extract the contents of the RAR archive, whereas ZIP is a widely used format supported by various commercial as well as open source tools, and libraries. ZIP uses a less complex structured format to store files. It uses the older yet popular DEFLATE compression algorithm to compress data which is less efficient than the newer compression methods which are not supported by any operating system by default. RAR uses a compression algorithm which is substantially better and efficient than the DEFLATE compression method. RAR uses a proprietary program called WinRAR archiver to compress/decompress contents of a file that comes with built-in support for password encryption which is great for security. However, the default support in Windows and Macintosh operating systems does not have password protection feature. Both are compression algorithms that efficiently compress your files to reduce their size without affecting the contents of the file. ZIP is the most widely used file format used for lossless data compression and has been around longer than RAR, and it still accounts for a significant number of archive files on the internet. However, RAR has better compression speed, better encryption, and lower rate of data loss. ZIP has been around for quite some time now, which makes it a little more popular than RAR, however, RAR surely has an edge over ZIP when it comes to speed and efficiency. Sagar Khillar. 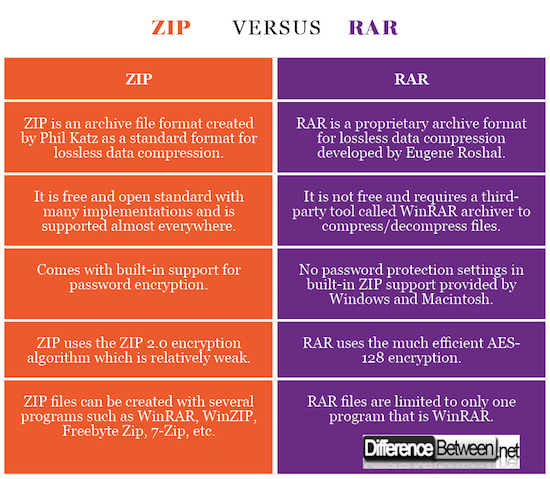 "Difference Between ZIP and RAR." DifferenceBetween.net. May 31, 2018 < http://www.differencebetween.net/technology/internet/difference-between-zip-and-rar/ >.